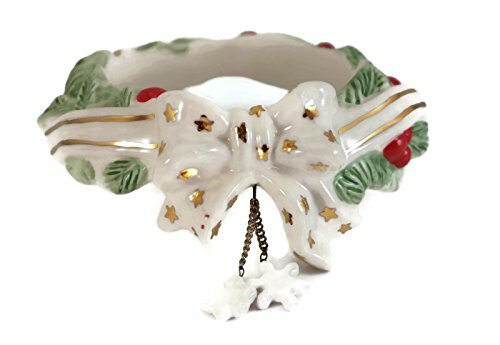 Holiday White and Gold Bow with Holly Berries Candle Ring for Glass Jar Candles - ring only, candle not included. Beautiful off white with gold stars entwined with holly berries and two dangle snowflakes. This ceramic candle ring fits standard sized jar candles to add a special touch. Shown on a candle (not included) that is 4 inches across and has a circumference of 12". This beautiful holiday candle ring meaures approx. 5 x 4.5" and the top is 3" across. Makes a great gift. Unique and eye-catching! This ceramic candle ring fits standard sized jar candles to add a special touch. Shown on a candle (not included) that is 4 inches across and has a circumference of 12"
This beautiful holiday candle ring meaures approx. 5 x 4.5" and the top is 3" across. Makes a great gift. Unique and eye-catching! If you have any questions about this product by Candle Toppers, contact us by completing and submitting the form below. If you are looking for a specif part number, please include it with your message.